To be eligible for this Competition (win a $1,000 travel voucher), an individual must be a legal resident of Australia or New Zealand, currently residing inAustralia or New Zealand and own a residential swimming pool. To enter the draw to win one of 2 Flight Centre travel vouchers (1 for AU and 1for NZ), individuals must enter their details via the Facebook entry page and name one BioGuard product. 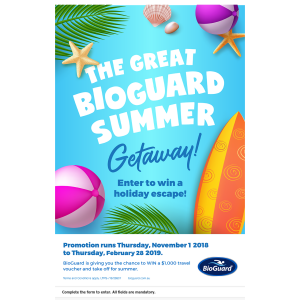 Directors and employees including their immediate families of BioGuard Approved Retailers, including BioGuardPoolside, its agencies and any business associated with such are ineligible to enter. The Promoter (BioLab Australia Pty Ltd / BioLab Ltd) reserves the right to verify the validity of entries and reserves the right to disqualify any entrant who thePromoter believes either has tampered with the entry process or has submitted an entry that is not in accordance with these Terms andConditions. Entries open: 00.01am (AEST) on Thursday, November 1, 2018 and ends at11.59pm (AEST) Thursday, February 28, 2019. Prize Winners will be notified by phone or email. The winners will also be promoted via the BioGuard Facebook page(https://www.facebook.com/BioGuardAUNZ/). Scan the QR code from BioGuard’s in-store POS or click on the Facebook link to take you to the online entry form. There is a limit of one (1) entry per email address during the competition period. Entrants must be 18 years of age and above. Withdrawal of Entry: If an entrant submits an entry and later wishes to have it removed from, or not posted to the intended contest, they should contact Hybrid Digital on +61 8 8113 0400 during business hours. All website entries are deemed to be received at the time of receipt into the Promoter’s database NOT the time of transmission by the entrant. Winners will be mailed their travel vouchers to their nominated address. The prize cannot be exchanged for cash or chemicals. The Promoter shall not be liable for any loss or damage whatsoever which is suffered (including but not limited to indirect or consequential loss) or for any personal injury suffered or sustained as a consequence of the use and enjoyment of the Prize, except for any liability which cannot be excluded by law. The winners will be selected at random as per the above dates. The draws will take place at Hybrid at 60 Halifax Street, Adelaide, South Australia, phone number +61 8 8113 0400. Once the Prize winners have been selected, they will be notified by email. If the Prize winners have not made contact with the Promoter within 3 months of the prize being drawn, the Promoter reserves the right to commence a re-draw of the prize for that particular Region. The decision of the promoter is final and binding and no correspondence will be entered into. The Promoter reserves the right in its sole discretion to disqualify any individual who the Promoter has reason to believe has breached any of these conditions or any instructions or directions on this site, or engaged in any unlawful or other improper misconduct calculated to jeopardise the fair and proper conduct of the competition. The Promoter’s legal rights to recover damages or other compensation from such an offender are reserved. Entrants are required to provide truthful information, and the Promoter will reject and delete any entry that it discovers to be false or fraudulent. Any costs associated with accessing the promotional website are the entrant’s responsibility and are dependent on the Internet service provider used. Any contact details entered incorrectly on the website will deem the entry to be invalid. All entries and information from entries become the property of the Promoter. The Promoter collects entrants’ personal information in order to conduct the promotion. If the information requested is not provided, the entrant may not participate in the promotion. Winners’ names and image may be published as stated in these terms and conditions. All intellectual property, including but not limited to trade-marks, trade names, logos, designs, promotional materials, web pages, source code, drawings, illustrations, slogans and representations are owned by thePromoter and/or their affiliates. All rights are reserved. Unauthorised copying or use of any copyrighted material or intellectual property without the express written consent of its owner is strictly prohibited. By entering this competition entrants consent to the Promoter displaying their name and image, should they win, on the BioGuard Facebook page, webpage and other marketing materials. Entry constitutes entrants' consent to their personal information [collected in the registration] to be used by BioGuard for marketing purposes. BioGuard may provide you with joint promotional offers in conjunction with other third parties. These promotional offers are developed in line with your needs, but should you not wish to receive this information, please choose to"unsubscribe" at the base of an email newsletter. The Promoter assumes no responsibility or liability for lost, late, unintelligible/illegible, falsified, damaged, misdirected or incomplete entries, notifications, responses, replies or any release, or for any computer, online, software, telephone, hardware or technical malfunctions that may occur, including but not limited to malfunctions that may affect the transmission or non-transmission of an entry. The Promoter is not responsible for any incorrect or inaccurate information, whether caused by website users or by any of the equipment or programming associated with or utilised in the Competition or by any technical or human error which may occur in the administration of the Competition. The Promoter assumes no responsibility for any error, omission, interruption, deletion, defect, delay in operation or transmission, communications line failure, theft or destruction or unauthorised access to, or alteration of, entries. The Promoter is not responsible for any problems, failures or technical malfunction of any telephone network or lines, computer online systems, servers, providers, computer equipment, software, e-mail, players, or browsers, on account of technical problems or traffic congestion on theInternet, at any website, or on account of any combination of the foregoing or otherwise. The Promoter is not responsible for any injury or damage to entrant or to any computer related to or resulting from participating or downloading materials in this Competition. Entrant assumes liability for injuries caused or claimed to be caused by participating in the Competition, or by the acceptance, possession, use of, or failure to receive any prize. The Promoter assumes no responsibility or liability in the event that theCompetition cannot be conducted as planned for any reason, including those reasons beyond the control of the Promoter, such as infection by computer virus, bugs, tampering, unauthorised intervention, fraud, technical failures, or corruption of the administration, security, fairness, integrity or proper conduct of this Competition. If for any reason this Competition is not capable of running as planned in any respect due to any cause beyond the reasonable control of the Promoter, the Promoter reserves the right, subject to the written directions of any relevant authority, in its sole discretion to cancel, postpone or amend theCompetition.